As the Director of Solution Development at CBT, I have the pleasure of interacting with our extensive partner network on a daily basis. It is this network that drives much of CBT’s success, as we rely on our partners to provide the industry-leading hardware and software products that compose the bulk of our solutions. One of the key engagements where I see the influence of our partner network is the RotF project at Texmark Chemicals. Each of the 15+ members of the project brings incredible value but without cohesion among the group, we could never deliver on Texmark’s vision. As the systems integrator on the project, it is CBT’s responsibility to maintain and nurture this cohesion and ensure the various technologies are integrated successfully. The unity among this diverse group of RotF partners is one of the top reasons the project is truly unique and groundbreaking. In this post, I would like to provide a more in-depth look at three of the most valuable RotF partners that are helping deliver five IIoT (Industrial Internet of Things) solutions to Texmark. Before I dive in, I must mention the importance of Hewlett Packard Enterprise (HPE) at RotF. HPE is the originator of the project and their support/guidance is a key reason CBT has the role of systems integrator today. However, since HPE and their impressive technologies are well recognized and understood, I will highlight the value of a few other top contributors. Today, I will focus on the ways Aruba, PTC and National Instruments are contributing to the project and provide a quick summary of their technologies. Also included in each section is a link to YouTube highlighting what each partner does in the IoT and oil and gas spaces that is bringing value to Texmark and RotF. Many industry veterans will be familiar with Aruba and the Networking Division of HPE. In short, Aruba is one of the leading networking companies in the world and offers a variety of connectivity solutions ranging from the data center core, to the edge, and everywhere in between. At RotF, it is Aruba’s expertise in wireless connectivity and location-based services that brings value to the project. One of the challenges of providing information access to refinery workers is the size and complexity of a refinery. Equipment and workers are spread out over a large geographical area and everything needs access to IT resources. Add to that the complexity of the refinery equipment…metal equipment is everywhere and can wreak havoc on a wireless signal. Whether it is a support technician in the control room, a foreman walking the plant, or a pump sitting out at the edge of the property, everyone and every device needs wireless access. Oh, and we need to know exactly where those people are located! Aruba technology allows us to deliver. Take a look at this quick Aruba IoT video to learn more. PTC comes to this project from the other side of the solution spectrum, providing a versatile software platform. PTC is a billion-dollar company with over 6,000 employees in 30 countries. Simply put, PTC is a global software company that delivers a technology platform and solutions to help companies design, manufacture, operate, and service technologies for a smart, connected world. In the case of RotF, PTC provides a software foundation called ThingWorx – a full function platform for developing augmented reality (AR) environments. 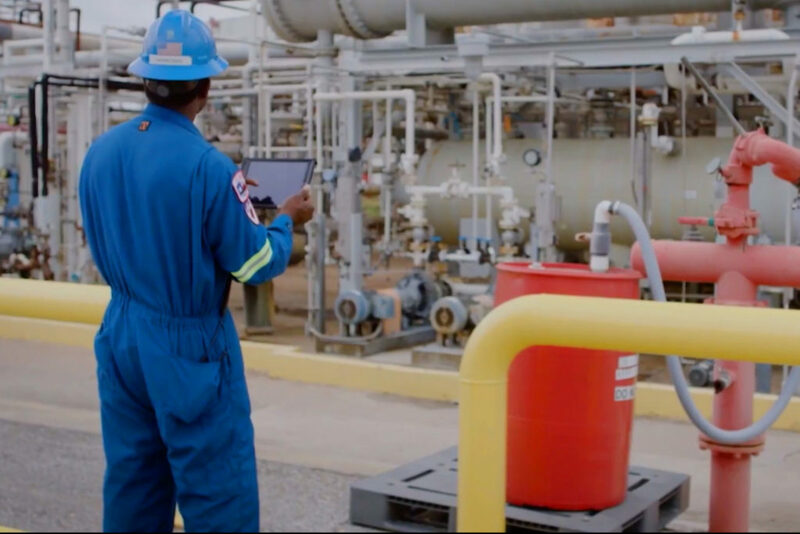 PTC ThingWorx works in conjunction with the data provided by other RotF ecosystem partners to deliver compelling augmented reality experiences that help improve efficiencies and enable safer, more productive workers. This is absolutely critical to the Connected Worker solution and certainly delivers one of the “wow” technology innovations for RotF. Take a look at this video. It’s not specific to a refinery environment but a great explanation of what ThingWorx brings to the table. The final partner I would like highlight is National Instruments. If you have heard of National Instruments you might ask, how is it that they are a Partner with CBT? Traditionally, CBT’s solutions have focused on providing business value derived from an IT environment. National Instruments’ solutions are OT (Operational Technology) focused. What does that have to do with CBT? EVERYTHING! The true importance of what CBT is doing at Texmark lies in the integration of OT and IT technologies, providing high-value synergistic solutions within IIoT. National Instruments provides a solution that bridges sensor-specific I/O to the IT world. They provide a device called the CompactRIO (installed at Texmark) that connects sensors coming from pumps that are out in refinery, back to the data center. National Instruments’ software is focused on solving problems by providing a user-friendly environment, ultimately reducing risk and enhancing productivity. Tie that into the PTC ThingWorx platform, mentioned previously, and users can view this data in a hands-free augmented reality environment. Here’s a quick National Instruments CompactRIO video for reference! By highlighting three partners involved with the RotF project at Texmark, hopefully it’s clear that this is not your ordinary IT, or even IoT, solution. The list of RotF partners is only getting larger and speaks to the amazing job that the group has done to bring this project together. Ultimately, our goal is to demonstrate that the technologies and IoT integration that we’re doing down at Texmark translate very well into many verticals, beyond just oil and gas. Together, the RotF partners design, test and deploy solutions to achieve next-generation innovation, efficiency, and safety. With RotF, we are making an investment in solving real, pressing business problems and proving why IoT matters. Interested in visiting RotF? Please use this contact form and our team will be in touch!